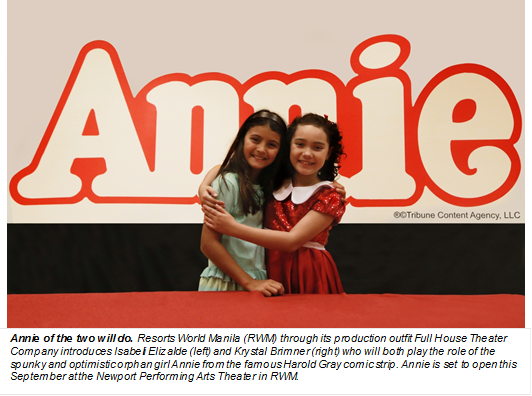 Resorts World Manila (RWM) recently acquired the rights for the classic and original Broadway musical, “Annie” from MTI New York. It is set to play on September this year at the Newport Performing Arts Theater. Preparations were underway and live and online auditions were held in search for the new Annie. Very recently, RTW announces that it had concluded its search and it has already selected the lucky young talent among the hundreds of hopefuls who auditioned to play the lead role. Krystal Brimner (9 years old), who recently won a Best Child Performer award in the 2015 Metro Manila filmfest for her role as Angel in Erik Matti’s Honor Thy Father. Isabeli Elizalde (10 years old), who takes her first shot at professional acting. Both were picked for the most coveted role as Annie. Krystal and Isabeli were made to perform song excerpts from the musical including the classic “Tomorrow” which caught the attention of Annie director Michael Williams and Menchu Lauchengco-Yulo who will be playing the role of Ms. Hannigan. Annie play dates and other details will be announced soon on this blog. Watch out for NindotKaayo.com’s review soon.